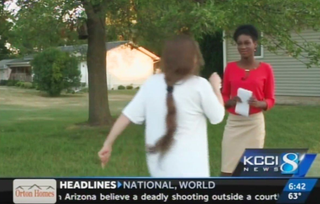 Reporter Emmy Victor stayed calm June 28, 2016, in Boone, Iowa, as a woman, identified later by police as the mother of a man police shot, shouted racial slurs. Emmy Victor is a morning reporter for KCCI-TV in Des Moines, Iowa. According to her Twitter bio, she’s also a New York City-Washington, D.C.-area native and a Howard University alum. And, according to the footage I saw of her, she might also be a Tibetan monk. A Tibetan monk? Why would you say that? While reporting on a police-involved shooting death of a man—and stationed across the street from where the shooting took place—both Victor and the cameraman she was working with were attacked by the dead man’s distraught mother, who also called Victor a n—ger. But instead of responding in kind—or, at least, giving her an Olenna Tyrell-esque read (which she would have been justified to do)—she kept it professional and even smiled. So, yeah, Emmy Victor definitely has had some monk training. Maybe she just attended the first day of monk camp or something. So she kept it 100 percent professional? Not 100 percent. More like 94 percent. There is a moment in the clip where Victor can be heard saying, “Don’t ever.” Which we all know is step 1 in the 12-step “Is she about to smack the s—t out of her? Yup, she’s going to smack the s—t out of her” process. But then she remembered her aunts would be super pissed at her if she came to the Fourth of July family cookout unemployed, and she shifted back to professional mode. I see. So, something you said in one of your answers struck me as odd. Victor smiled after being called a n—ger. Did I read you correctly? I thought so. How does that even happen? Being called a “n—ger” is one of the worst and most demeaning things that can happen to a black person. How can a black person hear that and … smile? Well, in Victor’s case you have to consider the context. She’s at work. And her work happens to be live TV. And she’s presumably undergone hours of training; training that maybe didn’t teach her what to do when a distraught redneck calls you a n—ger, but did teach her how to comport and compose herself in adverse situations. Also (and I’m just speculating here), although Victor was threatened, I don’t know if she felt threatened. Again, this is just speculation, but the smile seemed to be both an acknowledgment of how ridiculous the situation was and a belief that she could definitely, um, handle that woman if it came to that. It wasn’t a nervous smile as much as a “If this chick knew who she was messing with, she’d be the nervous one” smile. So you’re saying Victor’s reaction was due to her being at work and on TV? Because I can’t imagine a black person reacting like that after being called a n—ger in any other context. Not exactly. Look, it’s true that “n—ger” is the granddaddy of all American slurs and the most explosive word in the English language. And it’s been the impetus behind everything from fights and friendships ending to lawsuits and litigation. You call a black person a n—ger, and you’re basically giving that black person a moral (and, at times, legal) justification to do whatever he or she wants to you. Every black American either has or has been told a story about the time someone called someone a n—ger and that someone ended up spleen-shanked. But just as there are 40 million ways to be a black American, there are 40 million ways to respond if called that word. Sometimes it can be anger. Sometimes rage. Sometimes sadness. Sometimes fear. And sometimes you might hear it and get confused, like, “Did they just call me that?” Sometimes you’ve never been called it before and you’re surprised it didn’t wound you like you assumed it would. Sometimes you take one look at the meth-addicted, single-toothed, Mountain Dew-tinted miscreant who said it to you, and laugh at the audacity of someone like that thinking he or she could possibly insult you. Ultimately, what we (generally) assume happens when a black person is called that word is a bit different from what tends to actually happen. Furniture definitely moves sometimes. And sometimes it doesn’t. I see. So what’s next for Emmy Victor?